Yet I can’t help feel that the BBC is being unfairly pilloried, partly because it overpaid, and partly because it was, well, the BBC, and therefore unable to complete its vision. We do not see the financial performance of LP, but it won’t be pretty given what the write-down says about its costs, and the decline in the travel-book market, even though LP remains the market leader. But we do know that it was making the transition to digital, through its e-books, apps, and most importantly via its website. When it was bought by the BBC LonelyPlanet.com said it received 4.3 million visitors a month, that figure has since trebled. Most crucially, though we may baulk at how it played out, the vision of putting the BBC and LP under one virtual roof still looks compelling. Combining the BBC’s digital know-how, its wealth of content, historical and up-to-date reports from across the globe, with Lonely Planet’s brand, its publishing nous and its reach, still looks unbeatable. The entity could have offered a true unbiased constantly updated window on the world, powered by trusted content and embellished by social interaction from the many travellers and observers attracted to such a portal. Were Google to pull off something similar, we would all be applauding. 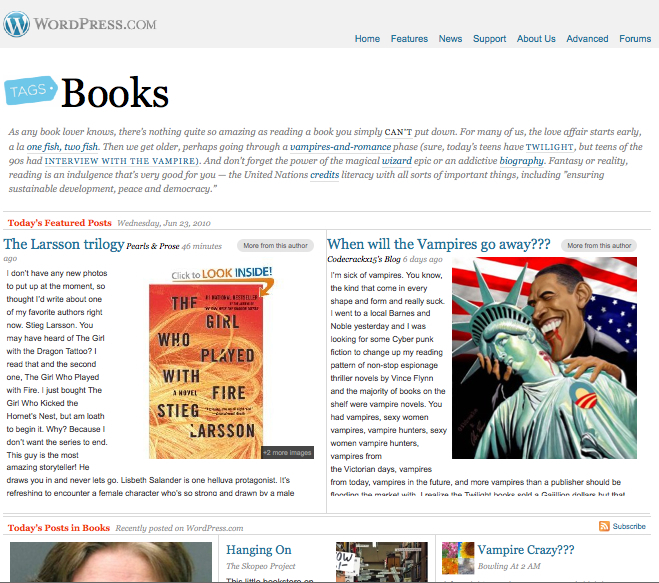 via The loneliness of the overvalued publisher | FutureBook. Last year I chose some folks who I though had made 2009 interesting in publishing terms and I believed would do the same in 2010. I think I was broadly right about them. You can see the 2009 list here. For 2010 I’m doing the same. Nash is moving ahead with Cursor a new type of publishing company based on communities, authors, shorter contracts and generally many of the ideas that have been floating around books for a few years now. He’s fiery, inspiring and willing to take a gamble (and be wrong too). He has spoken several times over the last few years about where publishing is going and he never fails to offer rich and convincing arguments to back up his point of view. I’m hoping he’ll be successful, not least because his first imprint community is called Red Lemonade! Sometimes you need people who just get down on the ground and shift dirt. IN many ways that is what Gareth Cuddy has done in Ireland. His DirectEbooks has been selling ebooks for some time now and as he would no doubt concede himself, right now the market is not mainstream, but it is getting there. He’s been pushing for more Irish publishers and small publishers to get into epublishing and through his EpubDirect service he’s offering publishers a decent way to get digital fairly quickly. Osprey really shouldn’t be cool (except maybe to military history nerds) but it is. It has created an online community for military history buffs and pioneered direct marketing methods that keep the company engaged with its readers and released a book on Zombies (complete with accompanying video). It recently bought the apparently unconnected Angry Robot Sci-fi imprint from HarperCollins and have shepherded it to great success. Much of this is down to Rebecca Smart’s savvy leadership and ability to drive change. She’ll no doubt say that the great staff behind her at Osprey are as much responsible and I think she’d be right, but even the best Army needs a good general. Mike is pretty darn smart. What’s more, he’s pretty darn good at putting his thoughts down in a clear, concise and accessible way. If you don’t read his blog, you really, really should. As one of the brains behind Digital Book World (a conference I’ll sadly not be attending this year) he has managed to start the in-depth conversations that US Trade Publishers NEED to have if they are to survive the shifting playing field of digital publishing. For that alone and the pleasure of reading the posts he shares so freely, he makes the list. The last choice is always a hard one when one is creating a small list. So I’ve cheated and chosen a team. I’ve done this for a few reasons. Firstly I think FutureBook (a blog and conference run by The Bookseller) came to life quickly, embraced the web rapidly and grew by engaging in a fashion that felt very web native and very focused on community and providing value. Secondly I felt that in doing that they provided a critical hub for debate and discussion about ebooks outside of the US but in the English language. It made ebooks real for many publishers and booksellers outside of the US and that was pretty useful in a year that has been dominated by digital developments. So well done to Samantha Missingham, Philip Jones et al, a fine job, well done.